The starting point is textile. She works with woven textiles with a light, transparent and frail expression. She includes in her works patterns which are transformed into elusive, light and changeable statements. She examines the possibilities of the thread in its pure form – draws with thread. 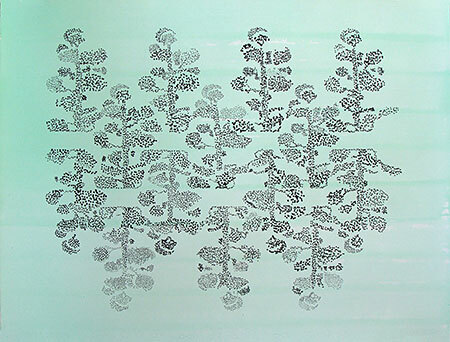 Combines the thin woven paper threads with laser cut patterns of paper or processed fabric..
Anne Bjørn also works in mixed media, often from photos which she edits and draws, paints and prints on. Pictures and drawings of textiles may form part of her works in line with patterns and symbols. Her themes are also transferred into site-specific land art projects. Anne Bjørn is preoccupied with the simple expression as a poetic force – with creating spaces and moods. Artist Society. Danish Visual Artists. The Danish Women´s Artist association. DKoD. Trees, Nagoya, drawing. 49 x 63,5 cm.